This is a guest post from Tamar Sloan, registered psychologist, and author of Grit for Writers, plus several romance books. You can find her website at TamarSloan.com and her blog about writing at PyschWriter.com.au. Writing can feel wonderful. There’s the indescribable sense of flow when the words pour out oh-so-effortlessly, there’s that stroke of brilliance when a plot twist strikes out of nowhere, there’s the feeling of creating something that no one else has before. Every one of those feelings is rewarding … and necessary for our long-term writing mojo. They drive us to keep on creating. But the road to publication is littered with unfinished manuscripts, dejected hearts, and writers wondering if they should turn around and head home. Success in the writing game is more of a marathon than a sprint, and our motivation tends to wax and wane. Rejection from agents and publishers, slow sales, negative reviews, and that most insidious underminer, self-doubt, are all hurdles every writer will face. Despite what some of the loudest voices out there are promising, it’s not an easy industry to succeed in. In a flooded, competitive market, how do you live your passion and keep reaching for your dream? Grit is the ability to stick with things that are important to you—through hell and high water, thick and thin, through thousands of words and hundreds of pages. Luckily for you and me, grit isn’t simply something you’re born with. It’s more like a muscle. With targeted effort, we can build it, grow it, and benefit from it. And you don’t just have to take my word on this; research has shown that to achieve success (across countless contexts), abilities like persistence and determination are more important than innate talent or intelligence in the long run. As a writing coach I’ve seen it, and as a writer I’ve lived it: grit is what enables writers to succeed in the publishing industry. The foundation of grit is the right mindset. Our writing success depends on the framework in which we view ourselves and our writing. A “gritty” mindset reframes and focuses the thinking we need to adopt, the passion we need to tap into, to keep reaching towards our dreams. I’m going to take you through three key ingredients of grit. Get these right, and you’ve got a foundation of resilience and willingness to work towards your goals of writing success. Think about which of these you’re already doing well at … and which you might want to work on during the next few weeks. We feel a sense of purpose when what we do matters to people other than ourselves. Our short stories, poems,books, scary, moving, funny, touching fiction are all for the reader, not just for ourselves (otherwise we’d be happy for them to remain in our computers). Ultimately, we create them to entertain, to inspire, to provoke what-ifs, to elicit emotions, to broaden horizons, to challenge perspectives. That drive is about touching others. Connecting to why we write allows us to be persistent in our goals and resilient when we experience setbacks because we feel inspired by something bigger than ourselves. Ask yourself—how does my writing contribute to others? Optimism is the expectation that tomorrow will be better than today. But grit takes the vague ‘here’s hoping tomorrow will be better’ and moves into the sphere of our control. Hope within the framework of grit is based on the expectation that our own efforts can improve our future. And the area that we have complete control of is our perception. As we experience the ups and downs and highs and lows of any writing journey, it’s important to remember that psychology has consistently demonstrated that how we view a situation will make a difference to how we feel, and how we act. Optimists – those that hold onto hope – see events differently. What’s more, they see failure differently. I always encourage people to reflect on where they sit on the pessimism-optimism continuum, and how it makes a difference to their writing success. This type of hope targets our perception and locus of control when it comes to our writing success. Discovering and implementing a growth mindset was a game-changer for my writing career. Those with a growth, rather than a fixed, mindset believe that their abilities can grow with effort. They understand that when they are learning or doing something new and challenging, that hard work can help them accomplish their goals. Growth mindset is empowering and motivating, and the key to many a successful writer (possibly all?). Ask yourself this—when you last experienced a setback, did you think it was a sign that you didn’t have what it takes, or did you see it as an opportunity to learn? I’m with Tamar about the importance of grit. I’ve met lots of writers over the years: some had obvious raw talent, but never got very far because they struggled to ever finish a piece. Others perhaps weren’t naturally gifted writers, but they constantly worked to improve … and they kept on writing, finishing, editing and eventually publishing their work. 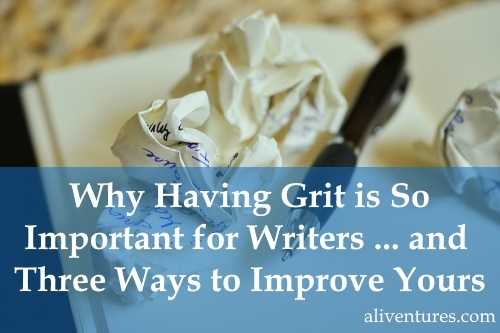 Are you missing one of the key ingredients of grit in your writing life? How could you work on it over the next few weeks? Feel free to share your thoughts in the comments below. Also, don’t forget to check out Tamar’s blog PsychWriter (“where psychology meets writing”) for lots of great posts covering topics like motivation, grit, and how to develop characters with rich and interesting inner lives. An interesting and timely article which I will share with my blogging friends. It can be hard to keep going when no-one much seems to be interested in what you’re creating and traffic is slow. Finally, I’ve been listening to a podcast series recently which interviews entrepreneurs about how they built their businesses. As you can imagine, optimism and grit are the two common denominators for all of these people. hey, Tamar’s view on grit is interesting. Touching others is key when writing indeed. Hey Codrut, lovely to hear from you from across the globe! I certainly believe touching others is why we write, it’s the passion that feeds my drive every day (there’s nothing more satisfying than hearing from someone who has read your book and loved it!). All the best, Tamar. A great post and very encouraging, thank you. My mantra is ‘persistent and consistent’ (I nabbed it from somewhere else) but it’s so true. Keep at it, chipping away, taking the knocks and setbacks on the chin, keep learning your craft and the marketing side of things. Keep on. Mindset is so important. You can always learn something from your failures. Hi Cheynne, I’m really glad to hear the post was helpful. I love the ‘persistent and consistent’ mantra, definitely two key factors in achieving success in this industry! Happy writing, Tamar. Haha! We have a very determined 5 year old whose ability to not take “no” for an answer will, I’m sure, take her far in life.